Halethorpe, MD- Bright and early on Saturday morning, twelve Maryland Carey Law students learned there is more to feeding the hungry than collecting food. 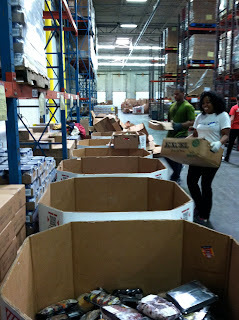 At the Maryland Food Bank, located about 15 minutes south of the law school, staff and volunteers sort, package and process donations that will supply over 600 partner agencies throughout the state, in every county except Prince George's and Montgomery. 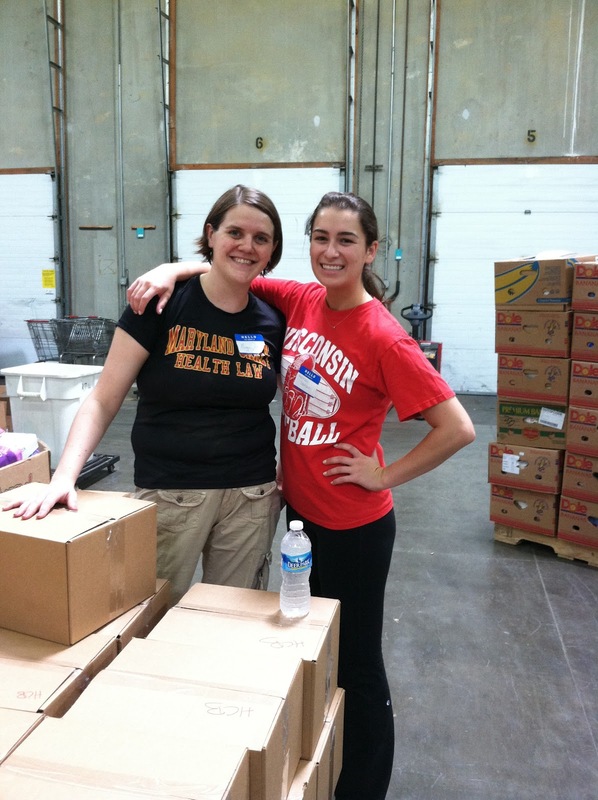 According to Maryland Food Bank staff, last year volunteers clocked 26,000 hours, but the need is still great. Sade Brooks helps Food Bank staff organize meat donations. "All the food packed and processed here will be out of the warehouse in 2-3 days," said Steve, the Food Bank employee who supervised the numerous volunteers from other organizations who joined the Carey law students. He stressed that the stagnant economy has increased the demand for donations, adding, "Even people with jobs are having to go to food banks." Maggie Davis and Hannah Levinson take a much deserved break. Maggie Davis, a 3L, organized the trip for the law school. She is chairing the new SBA Food Drive committee, whose goal is to streamline the three main food drives: Torts, Can Castle and the MELP Thanksgiving Food Drive. Maggie will also represent the school in the state-wide "Lawyers' Campaign Against Hunger," which is celebrating its 25th year fighting hunger in Maryland. At Saturday's event, the law students sorted meat, packaged bottles of water and toiletries, and worked the conveyor belt, examining donations and placing them in the appropriate bins to be packaged. The work was hot and dusty, but Food Bank staff was ready with kind words of encouragement and cold bottles of water. Caroline Fields and Zach Ostro sort food on the conveyor belt. A job well done, Steve called the entire group together to express his thanks and to warn them that, after hauling boxes all morning, they might be a little sore the next day. "You might not like me Monday...or Tuesday," he said with a smile.